The five-year survival rate for cancer patients in Japan stands at 65.2 percent, the National Cancer Center said in a survey report released Wednesday. The survey covered 214,500 people diagnosed with cancer in 2008 at 209 of 425 hospitals designated for cancer treatment as of 2015. This was the second release of results from a cancer-survival survey covering the core hospitals treating the disease in the country, although the center said the latest figures cannot be compared with the previous results because different survey methods were used. The latest survey on the five-year survival rate, which shows how likely it is that patients diagnosed with cancer will be alive at the end of that period, excludes those who died of other causes. 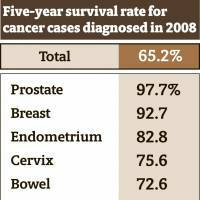 The center also disclosed on its website the survival rates for stomach, bowel, liver, lung and breast cancer by facility for the first time. 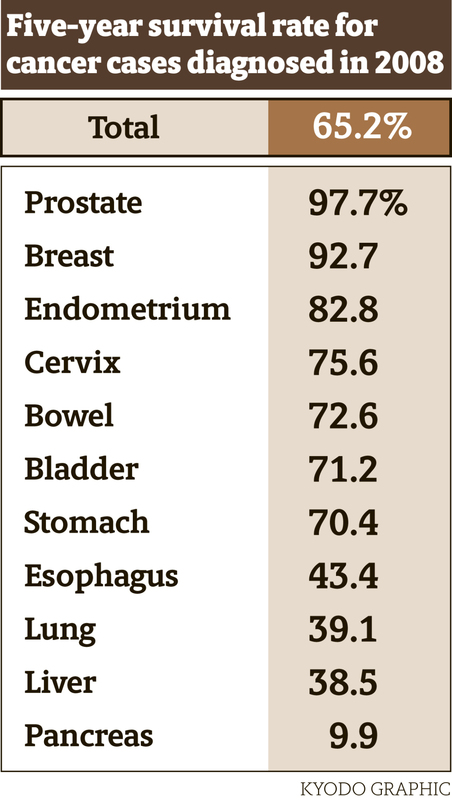 Data for these cancers by facility was collected at 188 of the 209 core hospitals that met a number of requirements, including being able to confirm whether at least 90 percent of their cancer patients had survived.